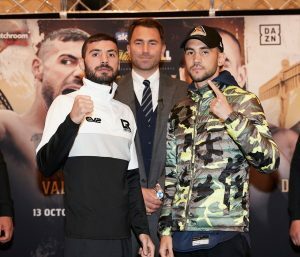 Lewis Ritson takes on Francesco Patera this Saturday for the vacant European (EBU) Lightweight title. In what is sure to be a partisan home crowd for Ritson with the bout taking place at the Metro arena in Newcastle. Nicknamed the ‘Geordie Golovkin’ due to his power, Ritson will be hoping to showcase some of this power against the Belgian, Patera (19-3). However it may not be as straight forward as the Newcastle public expect, with Patera having held the European title last year, losing to Ebis Tatli, who has since vacated. The 25 year old Ritson is in fine form, having secured the Lonsdale belt, given to a boxer after 3 successful defences, in the fastest time in history. Ritson won the British title against Robbie Barret last October and took a total of four rounds to gain the Lonsdale belt, dispatching Joe Murray, Scott Cardle and Paul Hyland Jr.
“I feel fine, it won’t be until Saturday night when the crowd goes mad that the butterflies may start going.” Ritson told Sky Sports News. Patera believes he can become the first person to beat Ritson, Ritson replied, “ Well we’ll see about that won’t we? We’ve heard that a few times now but I cannot see anything in his game that is going to trouble us. “I think it’s going to be a long night and we’ll get him out late. I don’t think it will go early as it has with other lads, I think we are going to get him out, but it will be late. “It’s another step on the ladder. If I want to get to where I want to be then I need to deal with people like Patera and get him out of there. So it’s a good step for us and we’re ready. Glen Foot defends his Commonwealth Super Lightweight title against Robbie Davies Jr, with the vacant British title on the line as well, in what could be a great fight. Foot, from nearby Sunderland, put on a great performance to win the Commonwealth title in Glasgow in March against Jason Easton. Davies Jr, from Liverpool, is the current WBA Continental super lightweight champion, regaining the belt in a rematch to Michal Syrowatka in March.